Ivation Foot Spa Reviews - Is it Really RIGHT for you? A stressful, tiring day at work calls for some downtime. While some people prefer to just sleep it off, others are looking to get comfort somewhere else. Spas are always a good idea, but sometimes, you don’t have time to go there. The good news is, you can experience spa comfort right at the convenience of your own home! If you are searching for the best foot spa, our Ivation foot spa reviews may be helpful. For people who tirelessly work on their feet or are constantly exhausted, a foot spa appears to be a necessity more than a luxury. With the Multifunction Foot Spa by Ivation, the ultimate resort experience is achieved with just a press of a button. Integrating the excellent features of hydrotherapy, heat, shiatsu, and acupressure, this foot spa offers massage and bubbling bliss to your tired feet. All you have to do is plug in the unit, fill it with water, and choose your preferred spa session. You can plug the unit anywhere that has a power source. You can use it at the convenience of your own home, and it doesn’t require any license for use. It helps regulate blood circulation. It provides comfort for your tired legs and feet. It comes with sophisticated features such as timer and multifunction selection. This product also comes with free brush and acupressure pedicure attachments. Some units started to malfunction after two uses. Leaks were also reported in some units. Some units have issues with its heating function. Who will benefit from Ivation Foot Spa? 1 Who will benefit from Ivation Foot Spa? The Ivation Multifunction Foot Spa is ideal for people who are standing on their feet for long hours. It is specially designed to provide comfort for people who are enduring pain or tiredness in their lower extremities. This product is also made for people who want to relieve their aching muscles and swelling feet. Its multifunction features provide comfort for achy soles, toes, and ankles. Its intense vibrating massage soothes weary feet and encourages blood circulation. This product also has motorized rollers that can target your tense and tired soles. Its multiple water jets produce bubble action to help relieve pain and pressure. The product’s heat provides some healing power for redness, swelling, throbbing, and more. You will find mixed reviews about the Ivation Foot Spa with 3 pedicure attachments on the Internet. But while this is the case, more people are satisfied while using this foot spa due to its excellent features. Most customers shared that the Ivation foot spa is a great pampering device, especially for those who endure tired legs and feet. While some reported issues with the product’s heating function, it seems to be one of the product’s best features as reported by most of the customers who used it. Many customers also expressed satisfaction with the product’s other features such as the roller and bubbles. One customer even said the Ivation foot spa helped his sprained ankle heal. Another positive feedback this product received is its dimension, which does not let the water splattered all over the floor. While there are positive reviews regarding this product, some people still reported issues while using this foot spa. Most of the bad reviews talk about malfunctioning units. A number of customers said the unit stopped working just after two uses. Although many customers commended the product’s ability to heat water well, others say the heat function isn’t working properly or tends to overheat, which can lead to burns. Despite the mixed reviews, most customers still highly recommend this product. 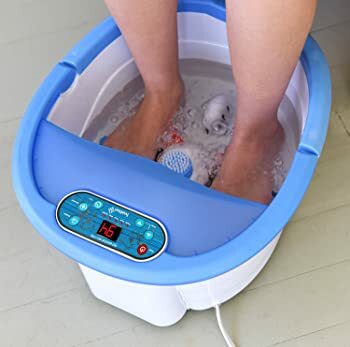 Some customers may have issues such as defective units or heating malfunction, but Ivation foot spa is excellently designed to provide the comfort your tired legs and feet need. It is also great in providing relief for sore muscles. 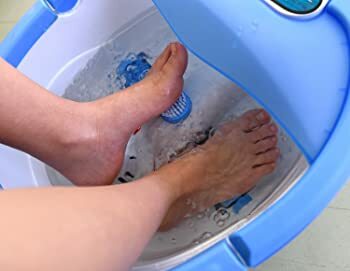 If you are considering to buy a foot spa, you can study the points included in this review before you decide if this foot spa is worth it for the money. We hope this article is able to discuss some valuable points to help you come up with an intelligent choice regarding your future purchase. If you think this foot spa will be beneficial for your or your loved ones, give it a try and give us an update regarding your feedback.